Tocqueville Asset Managements Sicart warns that hiding from the taxman is futile but postponing taxes, as Berkshire Hathaway does, is profitable. You can’t escape taxes, but you can gain an advantage by legally delaying their payment. That is a model that legendary investor Warren Buffet exemplifies, and it is one of several broad lessons on how investors can profitably think about taxes that Tocqueville Asset Management founder Francois Sicart offers in a letter to shareholders. Sicart shines a light on Buffett’s tax practices — made all the more noteworthy by the outspoken billionaire’s frequent advocacy for higher taxes on the wealthy — but not before urging investors to abandon a counterproductive propensity to escape taxation. The instinct for tax avoidance has been well honed by a history of wars, invasions and confiscations that has long conditioned people to hide their wealth, “preferably in another country,” Sicart writes. Europeans particularly, when not hiding their wealth from rapacious Nazis or in fear of a Soviet invasion, had to worry about the tax-grabbing depredations of the welfare state. Such fears generated flourishing global tax havens that were fully legal or at least tolerated. Sicart’s purpose in writing about taxes is to advise the newly wealthy who might be thinking in terms of tax avoidance that resistance to taxation today is futile. The sagacious fund company founder — who has been managing money since 1969 — first appreciated the tax landscape’s changing dynamics in 1981, when IBM introduced its personal computer. “It occurred to me that the odds had shifted and bank secrecy was doomed,” Sicart writes of the PC’s large databases, which would very soon give way to the massive information processing of today’s Internet age. The other key turning point was 1989, when the member states of the Organization of Economic Cooperation and Development (OECD) began formally sharing financial data as a means of combating money laundering and terror financing — cooperation that eventually led to “multilateral and bilateral tax treaties that have practically eliminated banking secrecy in most countries,” he writes. Thus, from a recent past in which hiding wealth was either not a crime or a tolerated act that was in any case hard to discover through existing technological means, wealthy investors today must come to grips with the fact that hiding from the taxman is now impossible. “In a world where the taxman is not only increasingly sophisticated, but also better informed and connected to colleagues worldwide, aiming for zero or minimal tax has become a fantasy that could eventually prove costly,” Sicart writes. That is not merely the result of tax treaties that require financial institutions to respond to tax authorities’ specific requests but, more significantly, because such exchanges of information are now automated. The Tocqueville Asset Management founder thus suggests wealthy households — particularly those potentially subject to taxation in multiple jurisdictions — would do better to concentrate on choosing where to be taxed rather than imagining they can achieve financial privacy. Sicart says common law countries (like the U.K. and U.S.) whose laws are derived from past court decisions are generally more protective than statutory law countries (like France) where legislative bodies write the laws, but may later retroactively change them. National taxation regimes vary in other ways as well. The U.S. for example taxes citizens and green-card holders on worldwide income; Britain taxes only those domiciled in the U.K.; Belgium also taxes only residents but mandates a reporting of assets held abroad. Thus, investors should beware of two powerful snares: tax loopholes, which authorities will eventually close once they become too costly; and tax breaks, usually put into place by authorities seeking to draw capital where genuine opportunity is lacking. In either case, longer-term profitability is sacrificed for an immediate tax gain, thus putting the tax cart before the investment horse. Investors would do far better to learn a lesson from Warren Buffett’s deeds if not his words. The Berkshire chairman has vocally advocated higher taxes on the rich, though also admitting to taking any legal action to reduce his holding company’s tax rate. Citing a recent Financial Times analysis showing that Berkshire’s effective tax rate is only little below the stated corporate rate, Sicart explains Buffett’s method not as evading taxes but legally postponing them. “For example, he has avoided selling divisions or subsidiaries, preferring instead to swap them for other assets or companies. Taxes on such swaps would only become due when the assets acquired in the exchange are ultimately sold. In Buffett’s case, this can be very far into the future, since his investment credo is, ‘The best time to sell a stock is never,’” Sicart writes. So the financial benefit of Buffett’s paying just $4.9 billion out of the $7.9 billion in taxes due in 2014 “amounts to what Buffett has described as an ‘interest-free loan’ from the government,” writes Sicart. Buffett will similarly have Berkshire sell shares, rather than pay dividends, in order to pay lower rate capital gains rather than the higher ordinary income tax that dividends generate. 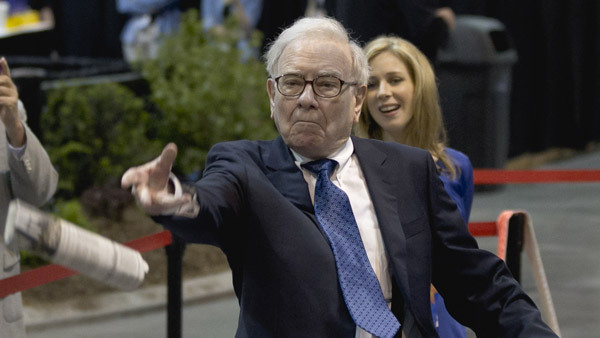 Sicart makes use of Buffett’s example to make the point that tax-aware strategies make sense only after fundamental investment strategies have been decided first — a far cry from the “paranoia” that leads many affluent households to focus on tax avoidance.